Fees associated with the German PCT national phase entry as well as other patent fees are available in the fee calculator. The time limit for German national phase entry of a PCT application is 30 months from the date of priority. The restoration of this time limit is not possible. The official language of the German patent application is German. For the PCT national phase entry, the submission of an application in any other foreign language is not permitted. To obtain a filing date, the patent application in Germany based on PCT must contain at least application materials in German as well as a request to grant a patent. The POA should be submitted only in case the representative is not a German Patent Attorney. The legalization or notarization of the POA is not required. The applicant must designate the inventor(s) and confirm that to his knowledge no other person has contributed to the invention. If the applicant of a German patent application is other than the inventor, or, not the sole inventor, the applicant must state how the right to the invention has been acquired. This document must be submitted within 30 months from the priority date. If an applicant does not provide the document within the stipulated period, the Office will invite the applicant to comply with the requirement within a time limit fixed in the invitation. Patent applications in Germany undergo formal and substantive examinations. The request to conduct a substantive examination must be filed within seven years from the international filing date. German patent application may be filed within six months after the disclosure at an official or officially recognized international exhibition or when such a disclosure was made in bad faith by any third party. The exhibition must fall within the terms of the Convention on international exhibitions signed at Paris on November 22, 1928. The official grant fee is not stipulated. Patents in Germany are in force for twenty years from the international filing date. Annual fees are due each year starting from the 3rd one and should be paid before the expiry of the last day of the month in which the anniversary of the international filing date occurs. If the fee is not paid before the expiry of the second month from the due date, it may be paid together with a surcharge of EUR 50 before the expiry of the sixth month from the due date. The approximate processing time from filing request for substantive examination to grant is 2-3 years. Inventions may also be protected as Utility Models in Germany, which are subject to formal examination only. Utility models protect technical inventions, including also chemical substances, food and medicinal products, except for processes (manufacturing and working processes, measuring processes, and others). Maximum protection period of a utility model in Germany is ten years from the international filing date. 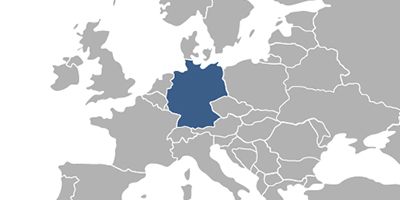 For a person neither residing in Germany nor having a principal place of business nor an establishment in Germany, it is required to perform the German PCT national phase entry through a registered German patent attorney or a foreign lawyer who is a national of a Member State of the European Union or of a State party to the Agreement on the European Economic Area authorized to represent an applicant in proceedings before the German Patent and Trade Mark Office. 1. Online Search databases: German Patents and Utility Models, European Patents (EPO). 2. The PCT application may also be nationalised in Germany via entering the European regional phase.